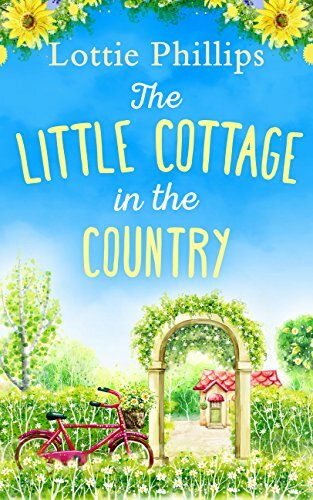 I’ve an extract from summery romantic comedy novel The Little Cottage in the Country for you today. Doesn’t that cover just make you want to be there right now? As well as the extract you have the chance to win one of three digital copies of the book so make sure you click the giveaway link. You’ll find details about the author Lottie Phillips and buying links at the end of the excerpt. It is available now and currently is only 99p for Kindle. ‘True.’ Anna took a deep breath and walked out onto the stage. She looked out at the audience and spotted Horatio in the front row with Jeremy by his side. ‘Hi, everyone.’ She nodded at Larry who smiled and pressed a button on the karaoke system he had brought with him. As the intro started up, she thought she might be sick. She opened her mouth and was amazed when actual words came out. ‘You can dance, you can jive, having the time of your life…’ Anna could hear the pitchy notes erupting from her mouth and she wanted to run, but the audience started to get to their feet. Within seconds, everyone was up and clapping out of sync with one another. Anna turned to see Freddie hitting his single drum as hard as he could with his sticks and Antonia threw in a ‘ching’ on her triangle whenever it suited her.She could hear how awful they sounded but grinned out at the audience all the same. She threw herself into the moves, writhing her body to the left and then to the right like she, too, was seventeen again. As her confidence grew, she threw in some Elvis-esque wobbly knee moves and a couple of urban-dislocating-neck-type manoeuvres. Horatio had started to spin like only people of a certain age can and Jeremy had his hands over his eyes as he tried to blot out the sight of his father ruining his primary school street cred in one fell swoop. Anna smiled as she watched Horatio adopt a sixties jive action, her heart momentarily fluttering when he bent down to ruffle Jeremy’s hair. The music came to an end and the audience cheered for more. Larry changed CDs over as quickly as he could, once he had skipped through a couple of tracks involving Phil Collins and Enigma’s ‘Return to Innocence’. ‘That’s the song we did it to,’ Diane whispered excitedly, and Anna was thankful they weren’t miked up. ‘Bohemian Rhapsody’ started and Anna looked at Diane with desperation. It was one thing to survive an Abba song, but a song with a million harmonies was a challenge too far. The most wondrous part of all was that they were actually in tune and sounded like they had been through an intensive course with Gareth Malone. ‘Before we took up protesting, we all sang in the college’s choir,’ Larry said out of the side of his mouth. Someone in the audience let out a whoop and, to Anna’s amazement, everyone got back on their feet and started to sway, some pretending to hold lighters. Anna had a flashback to her first ever Take That concert and beamed out at the audience. ‘We should go professional,’ Diane whispered as the choir started up behind them. ‘One step at a time,’ Anna said through her teeth. As they sang the final note, the audience clapped and whistled, begging for more. Mrs Beecham, her faith in humanity restored, ran up onto the stage and kissed Anna on the cheek. Anna smiled and left the stage, Diane close at her heels, as Larry rushed past them to pause Whitney Houston in full flow. The twins skipped up behind them, Freddie still trying to put a hole in his drum and Antonia determined that everyone would leave with tinnitus. ‘Where’s Mum?’ Anna said as she looked back at the stage where her mother was bowing elaborately for the audience and giving royal waves up to non-existent boxes. Anna, rolling her eyes, walked onto the stage and took her mother by the arm before dragging her off. ‘You were great,’ Anna said. A young boy of about ten trotted over to them and introduced himself as the school’s newspaper editor. Anna knew this actually consisted of a photocopied side of A4 that went out to the parents once a month. Her mother, on hearing the word ‘newspaper’, pushed herself forward and smiled at the boy. He looked up at her in earnest. ‘OK.’ The boy started to read the list of questions he had clearly been told to prepare earlier. ‘What’s your name?’ said the boy. ‘Dame?’ Anna said, shaking her head. ​Perfect for fans of Christie Barlow, Holly Martin and Tilly Tennant. Charlie Phillips, writing under the pseudonym Lottie Phillips, worked as a teacher before turning her hand to fiction. She was brought up in Africa and the Middle East and then – as an adult – travelled extensively before moving to London and finally settling in the Cotswolds with her partner and toddler. When she’s not writing, you will find her scouring interior design magazines and shops, striving toward the distant dream of being a domestic goddess or having a glass of wine with country music turned up loud. As a child, she always had her nose in a book and, in particular, Nancy Drew. The Little Cottage in the Country is Charlie’s debut romantic comedy. She is very excited to be sharing Anna Compton’s hilarious story with you! She also writes psychological thrillers under the pseudonym Louise Stone, including the best selling novel, S is for Stranger. Readers can find Charlie Phillips on Twitter @writercharlie or at http://www.writercharlie.com or www.writerlottiephillips.com.